Redshirt junior running back Patrick Laird exploded onto the scene with massive performances in Cal’s week-one upset over UNC and week-two win over Weber State. But with his touchdown celebration of turning the pages of a book, he made headlines with his extracurriculars as well. The celebration was no joke, so we caught up with him regarding his favorite hobby. When do you first remember starting to read as a hobby? I remember in second grade I would race to get my assignments done so I could pull my book out and continue reading it. I don’t remember if I did it in first grade, but definitely in second grade. Ever since then I’ve been always reading. Do you have a favorite book you remember reading in elementary school? I don’t know if I read this for school, but (Jean Craighead George’s) “My Side of the Mountain.” It’s about a kid who goes off and lives on his own, and I always wanted to do that for some reason. I always liked “Man vs. Wild” and all those survival shows. That would have been in sixth grade. Do you remember a particular high school English teacher who opened you up to new kinds of things? Yeah, Mrs. Hamm was awesome. She was my teacher for AP Language, my AP Literature teacher was Mrs. Domenic. Both of them thought I should have majored in English in college. I would talk books with both all the time. With Mrs. Hamm, my junior year, she got me this book “Literary Symbols” because she knew I really liked reading into symbols when I’m reading. That was a really cool gift. Was there a first more adult, mature book that you remember turning you on to more serious types of things? Freakonomics. I’m not exactly sure if that’s an adult book, I read that in seventh grade. But that’s when I transitioned into reading mostly nonfiction in high school, unless fiction was assigned in class. I guess that would be considered an adult book, but it was definitely my transition to non-fiction. Is there a classic book you read in high school that you remember not liking? “The Great Gatsby.” I didn’t hate it, but I thought it was overrated. I just thought that maybe there was some good criticism of the time and the lavishness, but the story itself didn’t really move along. Favorite author of the top of your head? I’ll say George R.R. Martin. I’ve read all the “A Song of Ice and Fire” books. Are you as into the show as the books? I’ve seen most of the episodes. I kind of skipped through season five and four, just because I didn’t want to sit through everything I read. I know it’s a little different but I just kind of skipped to season six. There’s debate about whether Martin will actually finish the series, how do you weigh in? I’m thinking he’s not ever going to finish it. Were you always into fantasy books? No, not at all. Only after my sister McKayla told me I should read the “Game of Thrones” series. She gave me the first book and then since I read that, I’ve gotten into fantasy. Pretty much everyone in my family is a reader. What’s your most recently finished read? “A Heartbreaking Work of Staggering Genius” by Dave Eggers. I just finished that a few weeks ago. I said I wasn’t really sure how I felt about it (a few weeks ago) but I really ended up enjoying it because I realized the way he started to employ dialogue was interesting, because it’s half-memoir, half-fiction. So the way he mixed in dialogue with people with dialogue with himself, I felt like I do that all the time and it was a great device for getting messages and points across. I started to enjoy the book a lot, I’m happy I read it. Any big attempts at writing beyond journaling? Writing a book is definitely on my bucket list, but I haven’t tried that. I do write everyday in journals. I’ll attempt at writing fiction sometimes, but I never share it. I’ll write satire, The Onion type articles and send it to my friends. I’ve written some short stories, I try to do twist, or at least surprise endings. Is there an author you try to emulate when you’re writing? No, because I probably wouldn’t do a good job at it. I just try to make it so if people are reading it, they would think it’s funny or at least not expect the end. “Oh, it’s just a normal story,” and then at the very end it’d be something no one expects. I guess Martin does that, he’ll write stories where who you thought was the main character ends up dying. So something along the lines of that, except I’m not as good of a writer as him. And it’s not fantasy. Who’s read your short story attempts? Just old friends. Maybe a few good teachers. I have a friend who’s a writer, not a professional, but he got published in one of his school’s book so if anything I’ll send it to him. It’s just funny because my friend gave me the book and I was reading it not really knowing who (Ishiguro) is. It’s interesting, he writes very simply, which is very different from Eggers who’s all over the place and very complex whereas this guy’s very simple. But he’s setting up some cool storylines, so it’s interesting. 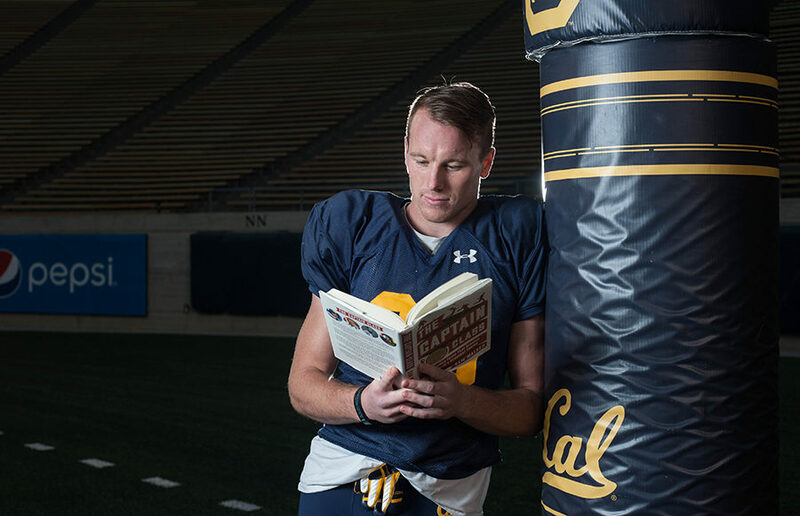 What’s your favorite book you’ve read since coming to Cal? I’ll say (Doris Kearns Goodwin’s) “Team of Rivals: The Political Genius of Abraham Lincoln.” I’m just getting into (political biographies), and I just bought another Lincoln biography because I want to read another one. I’ll say that book because it got me into those biographies. I’ve done Lincoln, FDR, Lyndon B. Johnson, and then I just bought a Thomas Jefferson one. I might do that one next, but I might do Walter Isaacson’s Leonardo Da Vinci biography. What do you think you like the most about those “great man” biographies? I love trying to pull something from their lives. Sometimes when you’re reading about someone you like to think that you could be like a part of them in some ways. So yeah, I like to do that with each person. Is there a particular book that has helped in those terms? I know “Freakonomics” has definitely changed the way I think about everything. I try to take a step back from society and see how people interact and how one decision has an effect down the stream. “Team of Rivals” really encouraged me to work on my writing and to continue to read and be open to a bunch of different things. That’s another thing with Da Vinci, he was interested in so many different things, so many different subjects. I think that’s something that would interest me as someone who likes a ton of different things. Who on the team can you talk to about books? A lot of people. I know Tony Mekari is into reading so I’ll talk to him about books. Pretty much everyone, there’s a lot of people who are into a lot of different things so I’ll pick their brains. A lot of people do come up to me now and ask what books I recommend. If you could give one book to everyone on the team, what are you giving out? (Charles Duhigg’s) “The Power of Habit.” I read that during camp, and if people can understand the process of establishing good habits up front, there’s a compounding effect of always doing the right thing over and over again for a long period of time. I think if people recognize that, it helps them get better. You seem to be into popular psychology, are you a Malcolm Gladwell fan? Yeah, I read “Tipping Point.” I have “Outliers,” I need to read it still. Have you ever taken any flack for your reading? Yeah, the friends I live with make fun of me all the time. “Why don’t you go read or something.” But I don’t care. In high school not really, because it wasn’t not normal. I guess it was the culture I was in, and now it’s more surprising to people that I read as a college football player. After fans stormed the field (after Cal’s win over Washington State) a lot of people came up and said, “I love reading, you’re awesome!” A bunch of moms came up to me and said, “We think it’s so cool you like reading and our kids love reading,” so I ended up taking these pictures with little kids pretending to hold a book. So I’ve gotten a positive response about it from most people but my teammates just like to heckle me about it. They’re not being too serious tough, they think it’s cool that they like to do it. You don’t need to say names, but did you ever have a tough guy coach who didn’t like the reading? Well, there might be some people on the old coaching staff that said, “You guys are too smart.” But they said that about everyone so it wasn’t specifically me. But this staff is all about being smart and being an individual and having a cool personality while also buying into the culture of the team. Have you taken an English class here? No, not from the English department. I was just focused on getting all my pre-requisites done for Haas, and getting all my breadth done. And then a lot of the cool English classes are in the afternoon when practice is. If you do eventually cross a book off your bucket list, what will the genre be? I think it’ll be non-fiction. I just don’t know if I practice enough fiction to make it interesting for people. I think I could figure out a cool subject that I could get really into for non-fiction. Maybe tie in some things from my life, we’ll see what I do with my career. What’s your favorite sports biography? I haven’t even read a sports biography. I’m not that into athlete (biographies) or sports fiction. My mom got me one over the break but I couldn’t get into it. Any important books to you we haven’t mentioned? Oh, (S.E Hinton’s) “That Was Then, This Is Now.” It’s a prequel or sequel to “The Outsiders,” I always forget. But that was my favorite book in elementary school. My friends and I started this book club and we would race each other to make it competitive because that’s how we were. So we’d pick a book and see who could read it the fastest, and that was the first book we chose and we loved it. You took AP Language and AP Literature, which side of the war are you on? I’ll say AP Lit because I got a five on the test.